Our Ageless Classic Facial is the ultimate Spa Facial. 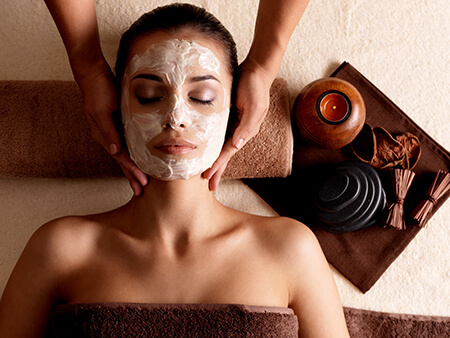 This Spa Facial begins with a deep cleansing of the face, using massage and steam. Following the deep cleansing and steam, a light exfoliation with massage is next to stimulated your skin and facial muscles. A pleasant mask is applied to this spa facial to target your skin type and then ending with applying various vitamins and antioxidants along with sunscreen for final protection. Serving the Ashland KY, Huntington WV and Portsmouth OH Tri-State Area! Ageless Classic Facial's are designed with you in mind from deep cleansing to stimulating massage. This Spa Facial varies from person to person but everyone should have some type of facial at least 4 times a year, at least as the seasons change. This will help you to maintain healthy, glowing skin. The Ageless Classic Facial is even for our patient with the utmost sensitive skin. The patient should use sunscreen SPF35 for 30 days. Makeup may be applied within 1 hour following the facial. The HydraFacial treatment is a new breakthrough in aesthetic technology and we now offer this procedure here at Ageless Aesthetics in Ashland, KY. Healthy skin is not just improving your appearance, but actually restoring youthful, healthy skin. The HydraFacial treatment merges soothing and invigorating spa therapies with advanced medical technology to achieve instant, lasting results. It's a resurfacing procedure that thoroughly cares for your skin. It provides cleansing, exfoliation, extractions, and hydration. It has a Vortex-Fusion tip that infuses antioxidants, peptides, and hyaluronic acid. The HydraFacial is a non-invasive, non-surgical procedure that delivers instant results with no discomfort or downtime. The procedure is immediately effective. It takes its name from the root word Hydrate; "to cause to take up moisture". 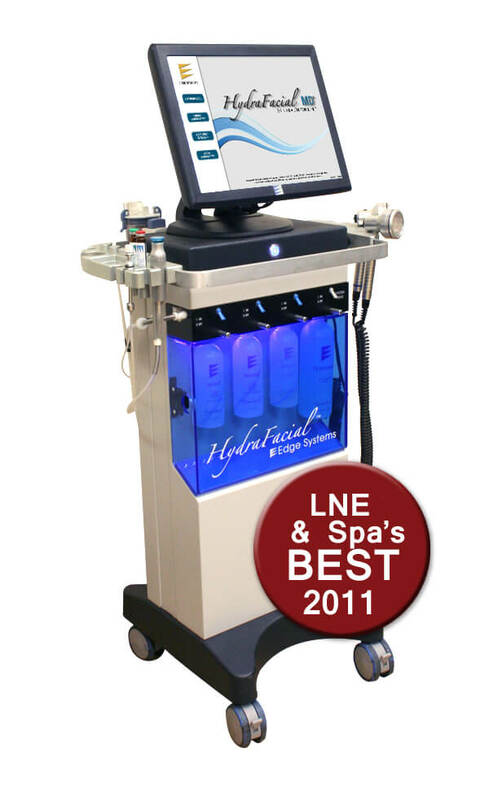 This ability to moisturize the skin separates the HydraFacial from all other skin resurfacing procedures. 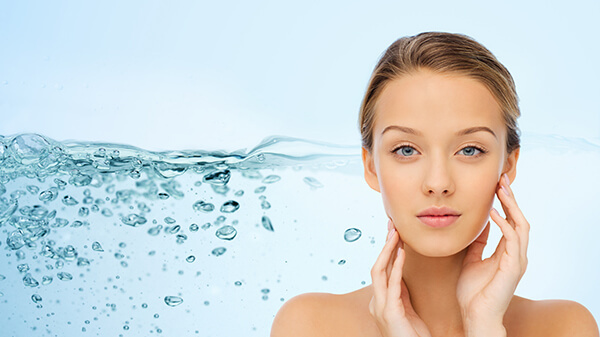 The HydraFacial treatment removes dead skin cells and leaves the skin feeling smooth and refreshed. It is the foundation of healthy, radiant skin. No Retin A for 2-3 days before the treatment, and must be off Accutane for 1 year. No tanning for at least 2 weeks before or after the procedure. You may put on make-up and return to your normal activates right after the treatment since there is no downtime. Many people report seeing visible skin refinement, evenest, and radiant skin tone after just one treatment. The smooth result and hydration may last 5 to 7 days or even longer. 1 treatment per month is recommended for improving the appearance of fine lines, wrinkles, hyperpigmentation, oily and congested skin. Continued HydraFacial treatments are highly recommended to maintain results. Clear Complexion Facial is beginning to revolutionize the treatment of acne, blackheads, whiteheads, hormonal acne, clogged pores, and large pores to help maintain and achieve beautifully clear skin. Treatment of acne is extremely varied from patient to patient. Sun exposure is known to have a beneficial effect on giving acne patients clear skin but at the same time there is the chance of hypo-pigmentation or hyper-pigmentation. We use a visible IPL (Intense Pulse Light) treatment through a mechanism similar to that of sunlight therapy with out the side effects of hyper-pigmentation or hypo-pigmentation giving you the clear skin you have always desired. 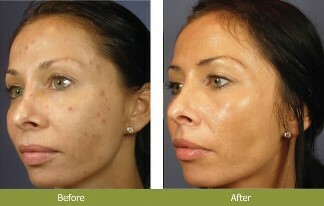 What is Corrective Acne Facial? Gently cleansing through massage and steam followed by a light microdermabrasion, by our specialized aesthetician. The IPL Treatment is then applied. It is effective in releasing singlet oxygen that is effective in killing bacteria, eliminating blackheads, whiteheads, hormonal acne, clogged pores, large pores and reducing the severity of acne. What Happens Before Corrective Acne Facial? Patient should stop all Retinols, Metronidazole Topical and all other oral medications which can make you sun sensitive for 7 days prior to treatment. Patient should not be in the sun or tanning bed for at least 7 days prior to treatment. What Happens Post-Care of a Corrective Acne Facial? Cleanse face twice a day, including after exercise. Avoid excessive skin washing. Shampoo hair daily and keep off face. Avoid skin infections and scarring by not squeezing, scratching, picking or rubbing the pimples. Avoid greasy cosmetics and creams which add to the problems of blackheads, whiteheads, hormonal acne, clogged pores, and large pores. Only water based formulas and mineral makeup are suggested. You may apply mineral based makeup within 1 hour after treatment. Patient will need to wear sunscreen protection for 30 days to help with prevention of hyper-pigmentation or hypo-pigmentation. The Oxygen Facial can be used for comfort, relaxation, and healing of the skin. Because of the nutrients, vitamins and antioxidants used during this relaxing facial, there are many healing factors involved that allows the skin to feel refreshed and rejuvenated. Oxygen improves the skin's elasticity and suppleness by strengthening the collagen and elastin fibers in the skin. We combine our Ageless Classic Facial with the dramatic benefits of a pure oxygen blast. 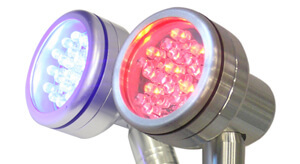 This unique treatment uses a delicately designed pure oxygen therapy to deliver different vitamins, minerals, enzymes and amino acids to the skin, providing moisture and revitalization to every individual cell. Our Oxygen Facial treatment is the ideal solution for post-travel and post-surgery conditions, or anytime your skin is suffering from tightness or dehydration and can also be used on any part of the body where the skin has been compromised. What Happens Before Oxygen Facial? The patient should not have any allergies to Aloe Vera, Vitamin A, Vitamin E, or Vitamin C.
What Happens Post Oxygen Facial? After an Oxygen Facial, the patient should use sunscreen SPF35 for 30 days. Makeup may be applied within 1 hour following the facial. A non-surgical, exfoliating treatment helpful for those unhappy with acne scarring, sun-damaged skin, age spots, freckles, stretch marks, fine lines, large pores, and rough skin. Treatment can be performed on the face, neck, chest, hands, and back. Microdermabrasion is performed with a stream of fine crystals, which are delivered across the skin's surface and then removed via vacuum, uprooting the damaged cells to reveal fresh, invigorated skin. This skin care treatment, in combination, with a facial massage allows the skin to be at its best. Before a Microdermabrasion, the patient should avoid Dermal Fillers or Botox injections for 10-14 days before the treatment. Before receiving treatment, the patient should be off Retinol products or exfoliation products for 5-7 days. No tanning bed or sun for 7 days prior to the treatment. What Happens Post-Care for Microdermabrasion? There is no downtime for these treatments. The patient's skin may be a little pink for thirty minutes to one day. Makeup can be applied after treatment; however, there should be no tanning through the natural sun or tanning bed for up to 72 hours. This unique procedure was designed by Christi Smith over 17 years ago. It has become one of our Ashland MediSpa favorites and most effective light chemical peels. The Chemabrasion includes a mini microdermabrasion followed by a light salicylic or glycolic chemical peel followed up with an oxygen treatment. This treatment helps minimize sun damage, brown spots, freckles, large pores, and acne scarring. A Chemabrasion is a little more aggressive than the microdermabrasion alone because of the light salicylic or glycolic chemical peel. Treatment areas include the face, neck, chest, back, elbows, arms and feet. Exclusively offered in the Ashland KY, Portsmouth OH and Huntington WV areas! Chemabrasion start with a light Microdermabrasion using a stream of fine crystals, which are delivered across the skin's surface, removing the damaged skin cells to reveal fresh skin. This treatment is followed by a light chemical peel to help remove excess oils and impurities below the surface of the skin also helping to remove clogged pores and blackheads. This will help lead you to the results of minimizing your pore size and fine lines. Lastly, an Oxygen Treatment delivers oxygen to refresh and renew the new exposed skin cells, minimizing the obvious sun damage, brown spots, freckles, large pores, and acne scarring. The bonus of this chemical peel is definitely the oxygen portion of this facial. There is absolutely nothing more soothing and revitalizing then a 100 percent oxygen facial! Before a Chemabrasion or Microdermabrasion, or any Salicylic or Glycolic treatment, the patient should avoid Dermal Fillers or Botox injections for 10-14 days before the treatment. Before receiving treatment, the patient should be off Retinol products or exfoliation products for the concerns of sun damage, brown spots, freckles, large pores, and acne scarring for 5-7 days. No tanning bed or sun for 7 days prior to the treatment. What Happens Post-Care for Chemabrasion? There is no downtime for these light chemical peel treatments. The patient's skin may be a little pink for thirty minutes to one day. Makeup can be applied after treatment; however, there should be no tanning through the natural sun or tanning bed for up to 72 hours. MicroNeedling is a new skin procedure in aesthetics care here in Ashland, KY for the treatment of fine lines, acne scars and improvement of the skin's overall appearance by stimulating and growing collagen and elastin. Click Here to learn more.